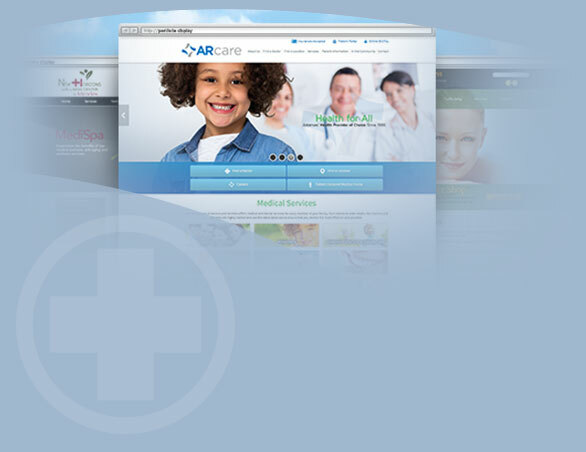 What defines a good medical website design? It’s not just about looks. While your website design should be beautiful, it should also be intuitive and clean, not confusing and cluttered. We use the right color palate, photos, and graphics to capture who you are as a brand. Placement of unique design elements like rotating header graphics and eye-catching buttons will speak directly to your audience. And, with our in-house quality assurance team, we ensure every aspect of your web design functions as good as it looks. Speaking of functional, a solid medical website design should help you achieve a goal. Whether you're looking to gain new patients, interact with them online, provide patient education, generate positive testimonials, or rank higher on Google, we get it done with concise “calls to action” on every page of your website and advanced search engine optimization (SEO) techniques. We highly recommend a responsive web design, which looks great on any screen size, including mobile phones and tablets. iHealthSpot does not use templates to create your website – every site is designed to your specifications. The home page will highlight what sets you apart from competitors, and invite the patient to learn more by delving deeper into the site. The internal pages will look different than the home page because we will be focusing on one service or specialty, but everything will flow together in a nice, cohesive design. As doctors and business owners, you understand the value of talented people. At iHealthSpot, you get a dedicated team of talented web professionals working on your project who specialize in medical websites. They are the cream of the crop and work relentlessly to bring your vision to life. We approach every medical website design project from the perspective of the patient or customer you are trying to reach. And, we have a proprietary process that ensures your project keeps moving.